Retrans from Australian Olympic Committee: Between competing all over the world, completing her university degree and finding the coolest costumes to venture out in biathlete Jill Colebourn keeps herself pretty busy. The 22-year-old is pushing towards making her Olympic debut in PyeongChang but there are plenty of things you didn’t know about Jill. I gained this result recently at the 2017 Winter Universiade – it was my best result of my athletic career so far and I’m so proud of this achievement! In this race, only the top 30 athletes from the individual and sprint races qualify to start. I started as number 27 and finished 23rd which was incredible for me and I am extremely happy with. I expected to be lapped and be forced to stop as the leaders are extremely strong in the World Cup, however I skied very fast and was able to completely finish the race. This is unheard of for an Australian biathlete as we rarely qualify to start in this type of race. Only two other Australian girls have ever qualified for a mass start and I am the very first Australian Woman to be able to finish! I’m so blessed to have parents that value travel, from a young age they have taken my brother and I all around the world to experience different cultures and ways of life. My favourite places have to be Egypt and Antarctica. I recently travelled to my 7th and final continent, Antarctica in December of 2016. It was an incredible experience to see the most breathtaking mountains, glaciers and wildlife. 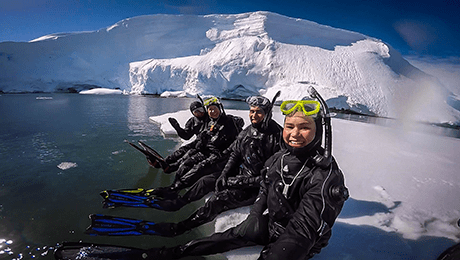 I was lucky enough to snorkel in the Antarctic waters every day of the trip and camp out for a night on the ice. It was amazing to witness all the organisms that can survive in the harshest environment in the world. I’ve held this title since I was 18 and first competed in the Open competition. I’m so blessed to be able to call myself the Australian Champion as well as represent Australia internationally. I really enjoy my studies and I feel that engineering is a great fit for me as I love maths and I like the creativity of making and developing products or projects of my own. 5. I love hiking and climbing mountains. I recently climbed Mt Yotei, an inactive volcano adjacent to Nisko Ski resort, while on a short post-season holiday after the Asian Winter Games in Japan. I can easily say this was one of my most challenging experiences snowshoeing up such a steep slope, carrying my downhill skis, boots and helmet on my back. It was worth it though for the amazing view and hour long ski down in untouched powder. 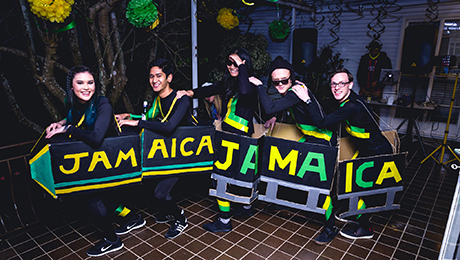 My best costumes so far have to be the Jamaican Bobsled Team at my 21st birthday party and Oceans 11 at a crime and corruption themed party- where my friend and I painted ourselves blue and labelled ourselves with a ‘1’. I was a part of the Perisher Wintersports Club training in moguls for two years before deciding I was better suited to Cross Country Skiing when I was 16. I don’t bet often, but when I do I get extremely excited when I don’t lose all my money. BIATHLON: The names Ole Einar Bjoerndalen and Martin Fourcade may not be well known in Australia but in the world of winter sports they are royalty. The duo have amassed a total of 18 Olympic medals and a staggering 64 World Championships medals between them having dominated a large part of the past two decades in the sport. They will no doubt be aiming to add to this tally over the next week as the 2017 World Championships get underway in Hochfilzen, Austria, where an Aussie by the name of Damon Morton will get the chance to line up against the world’s best. Son of Torino 2006 Olympian Cameron, Damon will make his World Championships debut as he looks to build towards emulating his father’s feats of making an Australian Winter Olympic Team. “The competition at this event is likely to be what’s at the Olympics so I need to be on pace with these athletes if I want to have any chance to qualify for PyeongChang,” Morton, who will become Australia’s first Biathlon World Championships representative since 2015, said. Lining up against the elite echelon of the sport for the first time, Morton is realistic about his goals for the event and moving forward. “Juniors to IBU Cup, which I have been competing in, is a step up but IBU Cup to World Championships is a massive jump up. Morton has been out on the snow in Hochfilzen for the past couple of days following a series of IBU and Junior IBU Cup events to start the season as he prepares for the biggest event of his life. “It’s been great to get out on the track to train and I’m really looking forward to competing. Morton will line up in both the 10km Sprint and 20km Individual events and knows he is up against some stiff competition. “I actually try not to think about racing against the big guns as they’re so far above my league that it’s a bit daunting. Morton’s first event is the 10km Sprint which takes place at 12:45am early on Sunday morning. 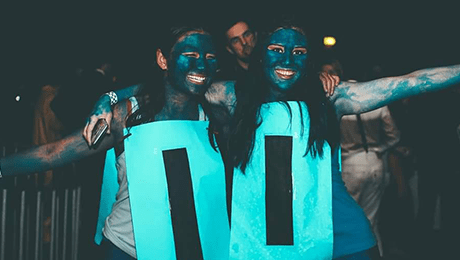 The 20km event then takes place at 12:30am Friday 17 February. 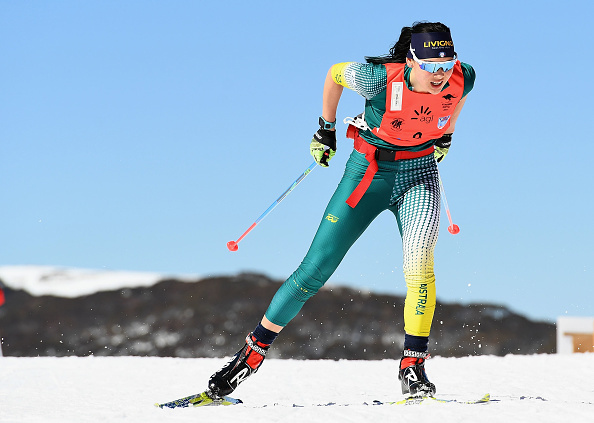 BIATHLON: It’s been a busy weekend for three of Australia’s leading biathletes who competed in the IBU Cup event in Obertilliach, Austria. In the men’s individual Damon Morton finished 61st and Daniel Walker claimed 111th. The duo backed up the following day to compete in the sprint event with Morton finishing 84th after missing one shot and Walker claiming 120th after missing three shots. Both Walker and Morton’s results in recent weeks have seen them qualify for the next stage of the IBU Cup (January, 2017) with the first event being in Martell, Italy (January 6-8). 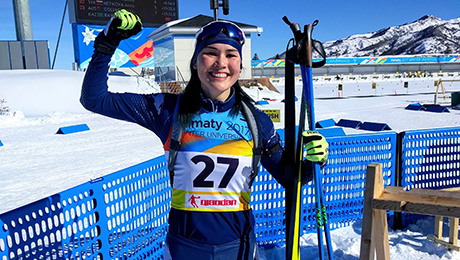 Damon’s younger sister Darcie, who competed at the 2016 Winter Youth Olympics earlier in 2016, was also in action finishing 73rd in the women’s individual and 69th in the sprint. Darcie’s result in the sprint also secured her qualification for the next set of IBU Cup events. The trio will be aiming for some strong performances in early 2017 as they go in search of qualification. Big long weekend of biathlon for Aussies at IBU events coming up! There’s a big long weekend of biathlon for Aussies at IBU events coming up! Australian High Performance Program members will be taking part in IBU Cup 2 in Ridnaun, ITA, with the largest-ever group of participants at Lenzerheide, SUI, for Junior IBU Cup 1. First off the mark will be Marlo, VIC siblings Darcie (16) and Damon (20) Morton, who will line up in tomorrow’s Single Mixed Relay at 8pm, Australian Time. On Saturday, they will take part in the Sprint event, as will Daniel Walker (22, Sydney NSW), supported by coach Nick Almoukov. Meanwhile, over at Lenzerheide, SUI, Junior athletes will take part in an Individual race on Saturday, and a Sprint on Sunday. In the Women’s races, Maddie Clarke (16, Melbourne VIC), Sabrina Howell (19, Sydney NSW) and Gabby Mahon (16, Melbourne VIC) will be lining up for Australia. The athletes will be supported by Australian Biathlon Head Coach Luca Bormolini. Full race info is at: www.biathlonworld.com. Races are conducted on Central European Time, which is 10 hours behind Australian Eastern Standard Summer Time. #GoAUS ! AUS Biathlon Championship results -another record year! The 2016 Australian Biathlon Championships were the most successful ever, with double the number of racers in 2014, and 40% higher than 2015, which was itself a record year. Racers took part in over 20 different age groups/categories, including Laser biathlon events for those aged Under 12. We were very pleased to welcome participants who travelled from Canada, Italy, UK and USA this season. Stand out performance for these Championships was Damon Morton, in the blue ribbon Open Class. In 2014 and 2015 Damon won all Victorian and Australian Men Open Championship races. Damon has followed up in 2016 with a clean sweep of first place in all Men Open Class races.